The Battle of Bosworth Field (1485) was actually fought near the small village of Stoke Golding. There Richard III, last Plantagenet King of England, died fighting against Henry Tudor. Despite arriving with a larger force that was well equipped with artillery, the intervention of Lord Stanley against the King led to the end of 331 years of dynastic rule and ushered in the Tudor era. By 1483 the Wars of the Roses had seemingly burnt itself out; the Lancastrian faction had effectively been annihilated in 1471 with the death (or murder) of Edward Prince of Wales at the Battle of Tewkesbury and the murder of his father, Henry VI, in the Tower of London. Only one real claimant remained - Henry Tudor who was descended from Edward III through the marriage of his third son John of Gaunt, Duke of Lancaster to Katherine Swynford. By contrast England's Yorkist King, Edward IV, was secure on his throne with two young sons and heirs; 12 year old Edward and 10 year old Richard. Moreover Edward IV himself was still comparatively young at only 40 years of age. But on 9 April 1483 Edward IV unexpectedly died and although his eldest son, the 12 year old Edward, was initially proclaimed as Edward V he was never to be crowned. The late King's brother - Richard, Duke of Gloucester - saw his nephews declared illegitimate and he was then crowned as Richard III. But his actions caused significant discontent amongst the aristocracy. His prompt execution of William, Lord Hastings and several members of the Woodville family (relatives of Edward IV's queen) did little to cement support whilst his favouring of men from his northern estates alienated other key factions. The unknown fate of Edward V and his brother Richard, the two 'Princes in the Tower', also harmed his reputation. All this led to a rebellion in 1483 which was supported by many former Yorkists. Whilst unsuccessful it effectively drove a number of powerful magnates to Brittany where they joined the 'court in exile' of Henry Tudor. To cement the support of the former Yorkists, Henry Tudor promised to marry Elizabeth of York, eldest daughter of Edward IV, once he was King; an offer that promised to unify the two families and bring to an end the hugely damaging dynastic struggle that had plagued the country for over twenty years. But the death of Richard III's wife, Anne Neville, in March 1485 led to rumours that Richard would marry Elizabeth himself. Notwithstanding the incestuous nature of this proposal (Elizabeth was Richard's niece), the claim was taken seriously by Henry Tudor for it had the potential to unravel his alliance. Seizing the initiative he sailed from Harfleur with 2,000 mercenaries ('of the worst sort') landing near Milford Haven in South West Wales on 1 August 1485. Upon arrival Henry veered north via central Wales hoping to recruit more support before facing Richard's forces. Meeting Lord Thomas Stanley on his journey, presumably to lobby for support, Henry proceeded down Watling Street towards London. Meanwhile Richard, who had expected the arrival of Henry Tudor that Summer, had moved to Nottingham in order to be ready to deploy against him. Upon hearing of the landing, Richard moved his forces to Leicester before proceeding down the Fenn Lane to intercept him on Watling Street. Overnight on the 21 August Richard camped around Ambion Hill near Sutton Cheney (the site of the visitor centre). Both forces were eager for battle. A third force - that of the Stanleys - was also nearby. Lord Thomas Stanley had shadowed Henry's army but had not made his intent clear. He held the position of Lord High Constable of England but Richard also had good reasons to suspect his loyalty for he was married to Henry Tudor's mother, Lady Margaret Beaufort, and had much to gain by being the King's father-in-law. Richard had attempted to mitigate this risk by holding his eldest son, Lord Strange, hostage. Richard's forces were believed to be between 10-15,000 strong and were formed into two battles; the vanguard under the Duke of Norfolk and the rearguard under the Earl of Northumberland. The vanguard comprised of a mix of archers and billmen as well as a significant array of field artillery. Richard was to the rear with around 100 heavy cavalry. Henry's force was smaller - believed to be in the region of 5,000 soldiers - and was divided into three battles with the veteran soldier John de Vere, Earl of Oxford in command. Henry was to the rear of his forces with a small lifeguard. The third force, around 5,000 troops under Lord Thomas Stanley, was deployed to the side of both forces. This was in two formations; the first under Lord Stanley himself, the second under his younger brother William Stanley. The battle was fought on 22 August 1485 across a part cultivated, part moorland landscape over which ran a Roman road (still in use). The fight was known to contemporaries as the battle of Redemore, meaning the place of reeds. Oxford deployed in battle array along the road but the vast difference in numbers meant he couldn't match the entire Yorkist frontage. Instead he chose to advance solely towards Norfolk's vanguard relying on the marshy ground to protect his right flank. As he advanced Henry came under intense artillery and arrow fire - a fact that has been confirmed by the recent archaeological evidence which has now conclusively placed the battle in vicinity of Stoke Golding. Indeed the Bosworth battlefield has now produced the largest known collection of cannon balls found in Europe consisting of shot of numerous sizes suggesting significant quantities of artillery were present at the battle. Whether these were exclusively from Richard's force is uncertain - it is possible Henry also had ordnance. As Oxford advanced, he spread his men out to reduce the impact of the artillery. 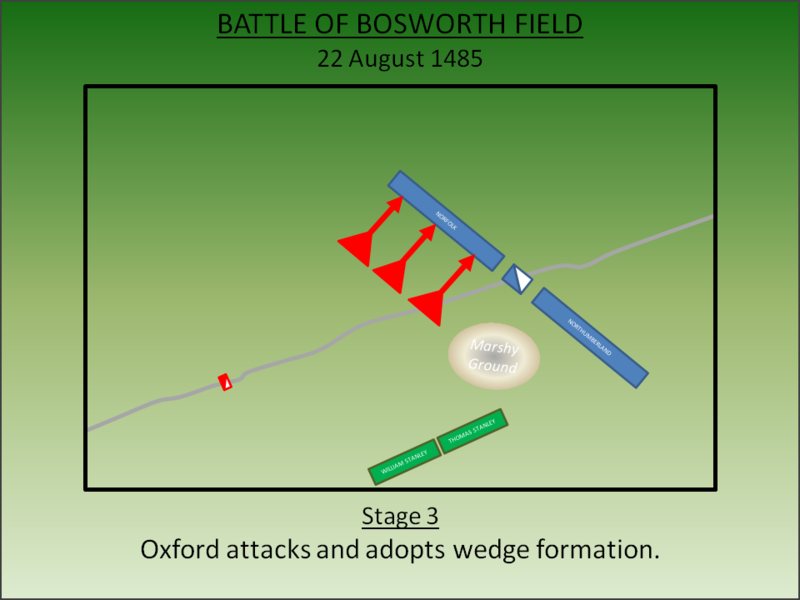 Utilising Roman military tactics, Oxford formed his forces into a series of wedge formations aimed at punching through Norfolk's line. 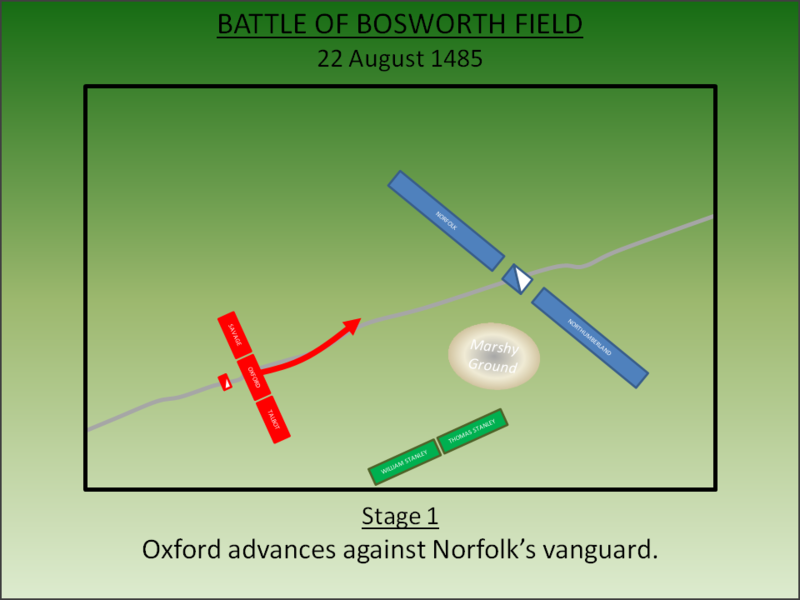 Oxford's advance seems to have placed pressure on Norfolk who slowly gave ground. 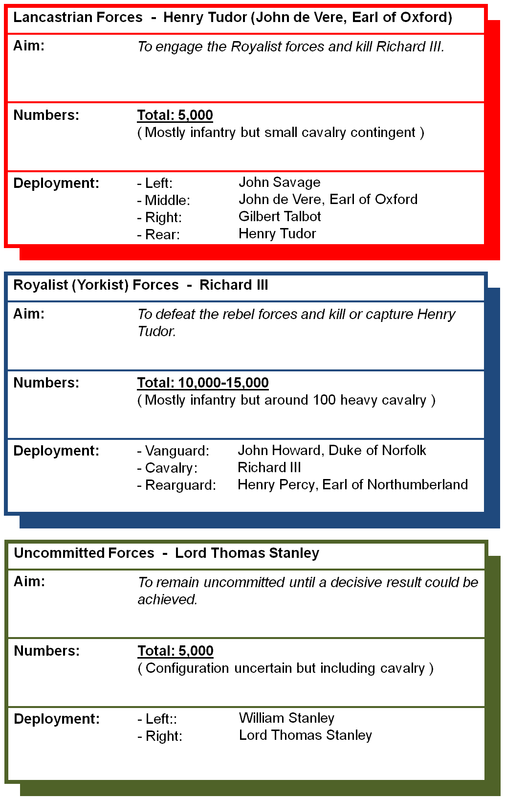 It is possible Richard may have now ordered Northumberland's forces to attack presumably to envelop Henry's force. But Northumberland didn't move and, assuming he was so ordered, the reason is unknown. It is possible he was constrained by the marshy ground or perhaps he had suspicions about the loyalty of the Stanleys and didn't want to commit his force with them to his back. It has also been mooted that a secret deal had been struck between him and Henry Tudor. Whichever was true, he held his position. Also at this time Richard ordered Lord Stanley to support him or else he would execute his son. Stanley coldly replied "Sire, I have other sons". Richard ordered the immediate execution of Strange but this was never implemented. Undoubtedly now concerned about an imminent betrayal by Lord Stanley, Richard received intelligence that Henry Tudor was some distance behind his troops and was now seemingly making his way to the Stanley lines, presumably to entreat them to commit to his side. Confident of his own skills, Richard personally led a small detachment of heavy cavalry and charged the small force surrounding Henry Tudor. Richard was very nearly successful in his attempt. He smashed through Henry's lifeguard and killed his standard-bearer, Sir William Brandon, and unhorsed John Cheyne, Edward IV's former standard-bearer. Fierce fighting followed as Henry's bodyguards surrounded him. Seeing the desperate plight of Henry Tudor, William Stanley now committed to the battle on Henry's side. He led his men into the fray attacking Richard and his small force which was swept aside. Richard found himself bogged down in the marshy ground and lost his horse, or was forced to dismount, at which point he was surrounded by the combined forces of Henry Tudor and William Stanley. Fighting on foot, refusing an opportunity to flee and declaring he would live or die as a King of England he was cut down possibly by Rhys ap Thomas. Concurrently, perhaps as a result of the Stanley charge, Norfolk's vanguard broke and fled whilst the rearguard under Northumberland also retreated without engaging. Royalist casualties were around 1,000 including Richard III and the Duke of Norfolk. Lord Thomas Stanley, who had played no part in the battle personally, rode to congratulate Henry Tudor producing a Golden Crown he 'found in a thorn bush'; an act that would see him rewarded with the Earldom of Derby. The body of Richard III was taken to Leicester where it was displayed as proof of his death. Thereafter Richard was buried, with little dignity, at the Church of the Greyfriars where he would remain until discovered in 2013 and re-interred in Leicester Cathedral. The Earl of Northumberland surrendered and was ultimately pardoned. Despite the crucial role he had played in the battle, William Stanley didn’t prosper for long; he was executed by Henry VII in 1495. The battle is significant for ending the Plantagenet era - a family that had ruled since the accession of Henry II in 1154. As he promised, the new Henry VII married Elizabeth of York which defused the Wars of the Roses. Whilst a further battle would be fought at Stoke's Field in 1487, the Tudor regime survived and prospered for the next 118 years changing England forever. Henry VII dismantled the capacity of his key magnates to raise their own troops ending their ability to wield power against the King and thus creating a powerful centralised state which would facilitate the religious reforms of Henry's son and grandchildren. The changes also saw Wales start to become an equal partner within the Kingdom aided by the truncation of the powers of the Marcher Lords. Henry also pursued a policy of alliance with Scotland and the marriage of his daughter, Margaret Tudor, to James IV would pave the way for the union of the Crowns in 1603. Baldwin, D (2013). Richard III. Amberley Publishing, Stroud. Bennett, M.J (1985). 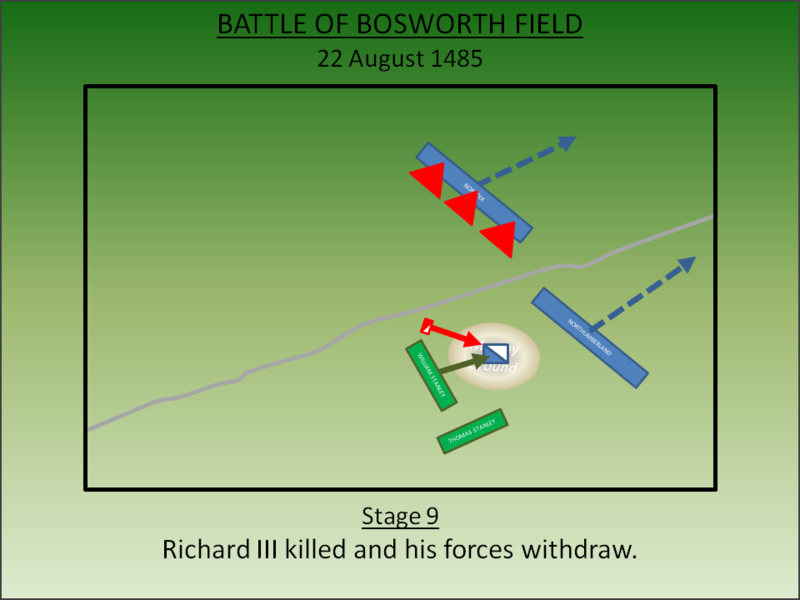 The Battle of Bosworth. Alan Sutton, Gloucester. Foard, G (2004). Bosworth Battlefield: A Reassessment. Leicestershire County Council, Leicester. Foard, G (2013). Bosworth 1485: A Battlefield Rediscovered. Oxbow Books, London. Foss, P (1998). The Field of Redmore: The Battle of Bosworth, 1485. London. Gairdner, J (1896). History of the Life and Reign of Richard III. University Press, Cambridge. Gravett, C (2000). 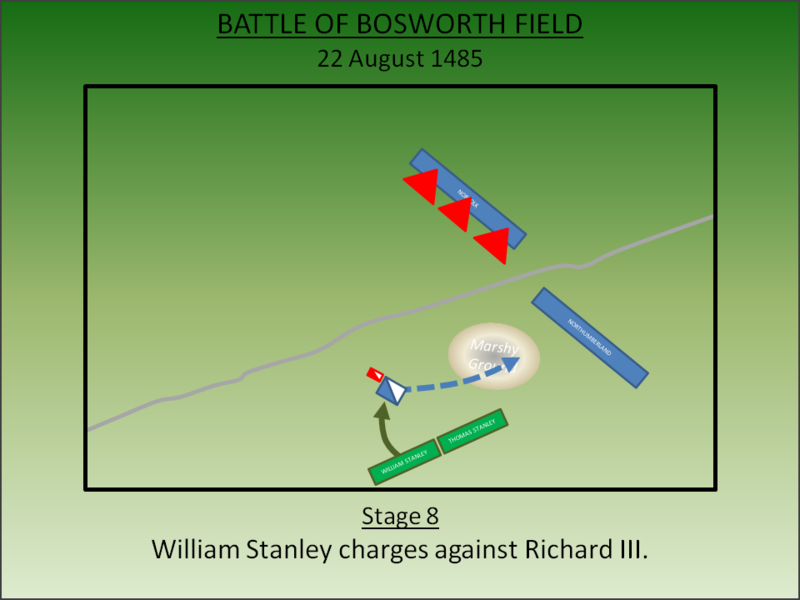 The Battle of Bosworth. Osprey, Oxford. Hall, D (2007). 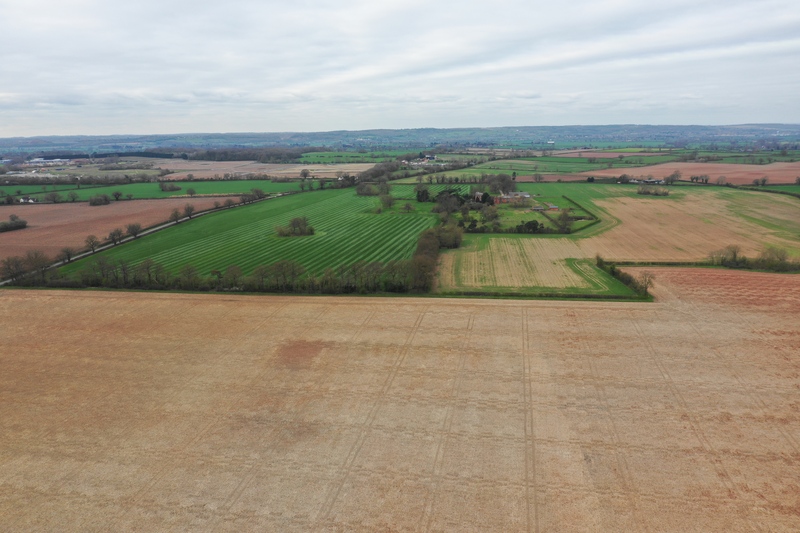 Survey of the open fields for the Bosworth Battlefield Survey. Lancaster, J.H.D (2013). Bosworth Field: Battlefield visit notes and observations. CastlesFortsBattles.co.uk. Masters, P (2008). Geophysical Survey at Bosworth Battlefield. Shenton, Leicestershire. Ordnance Survey (2015). Hinkley and Bosworth. 1:1250. Southampton. Ramsay, J.H (1892). Lancaster and York: A Century of English History (AD 1399-1485). Oxford. Partida, T. and Foard, G (2009). 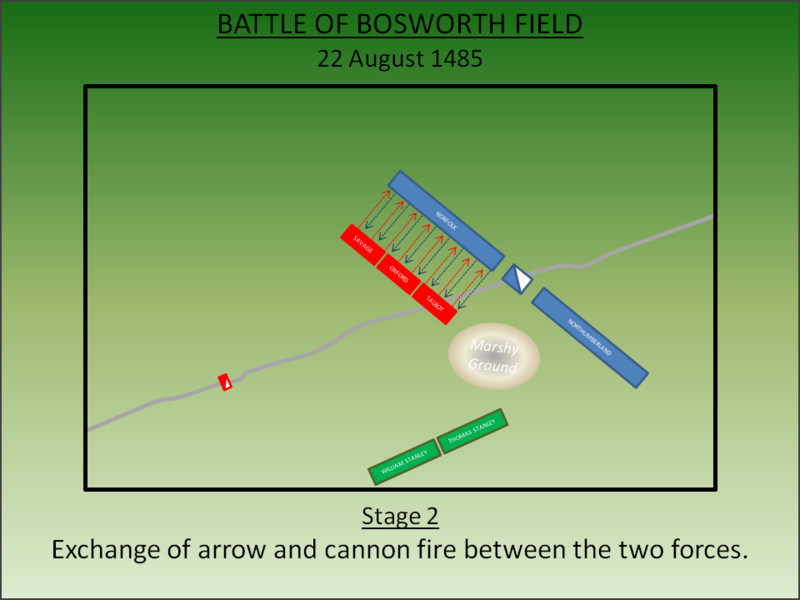 Bosworth Battlefield Survey: Post Medieval Historic Mapping Report. Seward, D (1995). A Brief History of the Wars of the Roses. Robinson, London. 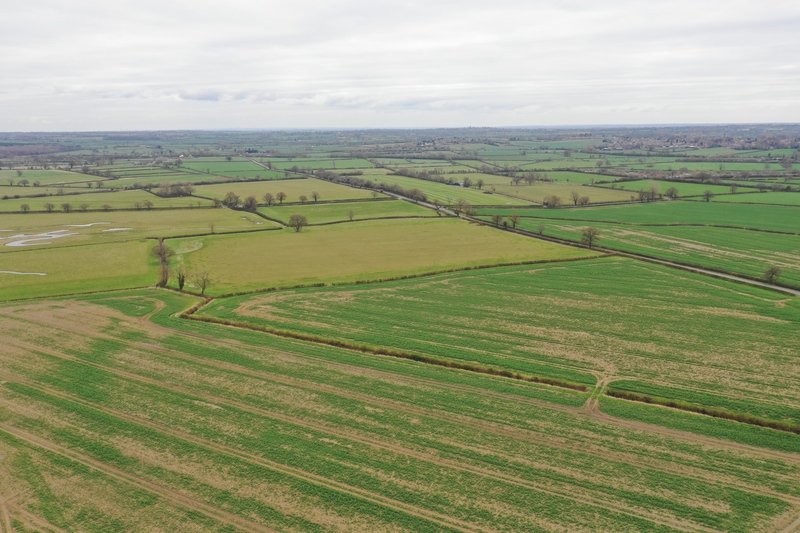 The landscape differs significantly from the fifteenth century as the lands on which the battle was fought have been drained and the vast bulk is now farmland. However, the Fenns Lane follows the line of the Roman Road along which Henry Tudor advanced. The area can be accessed via a series of quiet public roads and rights of way that extend south-west from the Visitor Centre on Ambion Hill. Tudor Position. Henry Tudor advanced along Fenn Lane (to the left in the photograph) and deployed to the north of the road as the southern side was marsh which he used to protect his right flank. Royalist Position. Richard deployed his forces in two main battles. His own forces straddled the road (seen in the right of the photograph) whilst the Rearguard under the Earl of Northumberland was to the north. Note the water-logged field in the top-left; Northumberland may have been deployed behind this which may have made him reluctant to advance. King Richard’s Well. 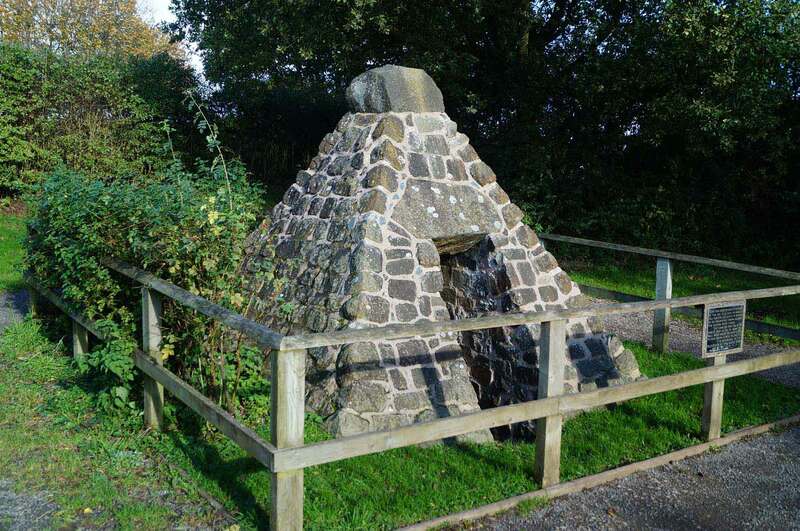 A monument built to commemorate Richard III at a natural spring where the King is alleged to have rested during the battle with his horse drinking from the well’s water. Given the actual location of the battle was to the south-west, this is highly improbable. View towards Bosworth. Originally known as the Battle of Redemore, it later became known by the name of the small village near Albion Hill. In actual fact the conflict occurred a mile to the south-west of Albion Hill near Stoke Golding. The summit of Albion Hill where Richard III's army camped prior to the battle. The King himself stayed in the White Boar Inn. From the visitor centre - samples of billmen in their typical attire during the battles. The visitor centre, although sited at Richard's camp rather than the battlefield, is an essential first stop when exploring the area. It is well sign-posted with a dedicated car park. The battlefield itself is on private land but can be accessed via a series of (quiet) public roads and rights of way. It is not recommended walking down Fenn Lane as this road has no significant verge and the traffic is normally quite fast.